Foamy Fortunes Scratch Card Guide & Review - Casino Answers! 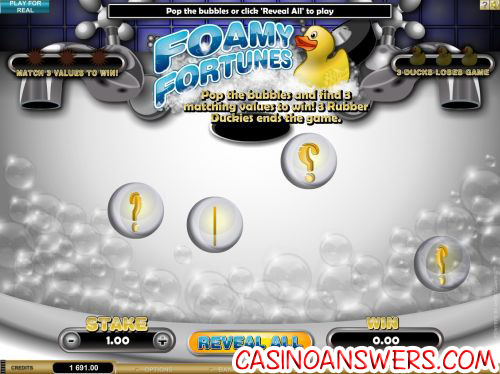 Foamy Fortunes is an online scratch card developed by the Microgaming online casino software provider. You can play Foamy Fortunes at First Web Casino and Virtual City Casino. To play the Foamy Fortunes scratch card, you must first select your stake (or wager). It can be any dollar amount up to $10. Once you are happy with your stake, hit the “New Card” button to play. Once you hit the “New Card” button, you will see bubbles pop up. Pop them by clicking on them to reveal multipliers or use the “Reveal All” button to jump to the end of the game. One interesting thing about Foamy Fortunes is that there is not a definite number of symbols in the game. It can end in as few as three bubbles (albeit unlikely) or it can go on for quite a while before you match three multipliers or three ducks. Multiplier values (or payouts) on the Foamy Fortunes scratchie instant win casino game are as follows: 10,000X, 5,000X, 1,000X, 500X, 250X, 100X, 50X, 30X, 15X, 10X, 7X, 5X, 3X, 2X and 1X. Foamy Fortunes is an interesting take on the scratch card that we haven’t seen before. The downside is that wins don’t happen to be very common, but when they do happen, they tend to be rather large. To play the Foamy Fortunes scratch card casino game, please visit First Web Casino! Are USA casino players able to play the Foamy Fortunes scratch card? No, American players cannot play scratch card games at Microgaming online casinos for real money. We recommend you head over to a Rival-powered casino such as Paradise 8 Casino and play some of their scratch card games such as Gunslinger’s Gold. How do I win on the Foamy Fortunes scratch-and-win game? To win on the Foamy Fortunes scratch lottery ticket, you must match three of any multiplier value before you match three duck symbols. How much can I win on the Foamy Fortunes instant win game? If you make a $10 bet on a scratch card and match three 10,000X symbols, you will win $100,000 playing Foamy Fortunes at First Web Casino! Can I get a no deposit bonus to play Foamy Fortunes? Yes, Virtual City Casino offers a $10 no deposit free cash bonus when you register for a real money account. However, you must give them your credit card information to verify your identity. No charges will be made to your card. Is there a Flash/Instant Play version of Foamy Fortunes? Yes, you can play Foamy Fortunes in your browser using Flash at any Microgaming online casino, including First Web Casino and Virtual City Casino. If you experience any issues with the scratch card flash game, try installing the latest Adobe Flash Player version. What online casinos have the foamy fortunes scratch card?